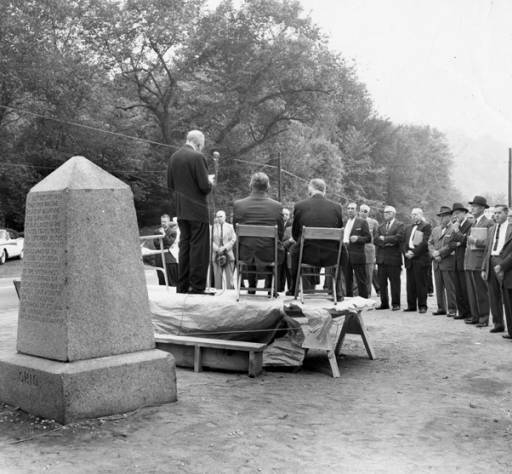 "Dedication of "Point of Beginning" Marker, September 30, 1960 - (175th Anniversary). The pictures in this group: Creator - Dawson, Harold A.. Location Depicted - East Liverpool (Ohio). 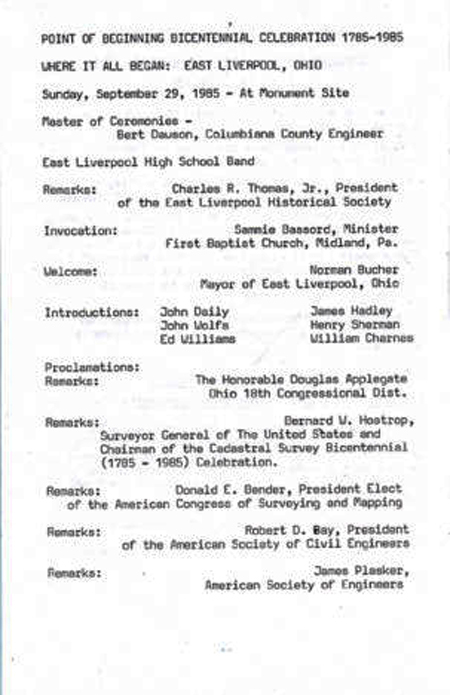 Time Period - Decline and Comeback: 1960-1990, Date Original - 1960 - Collection - East Liverpool Collection.- Digital Publisher - Cleveland Memory Project. 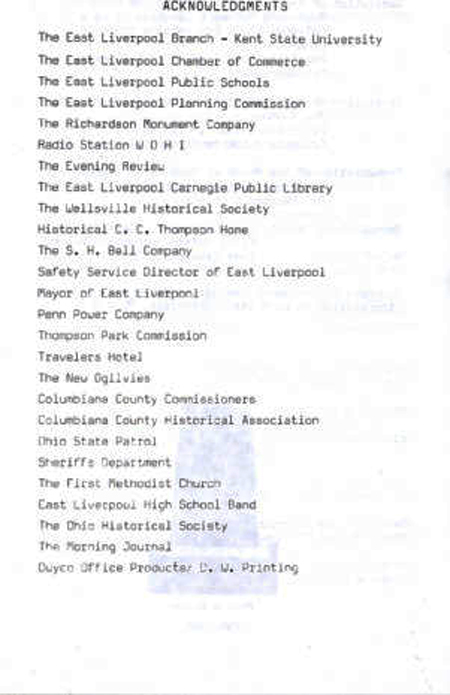 - Donor - East Liverpool Historical Society - Repository - East Liverpool Historical Society. Original 1785 Marker of "The Point of Beginning" for the U.S. Federal Land Surveys located on the Ohio-Pennsylvania Description This is the original marker that marks "The Point of Beginning" of the Township and Range survey system that resulted from the Federal Land Ordinance of 1785. 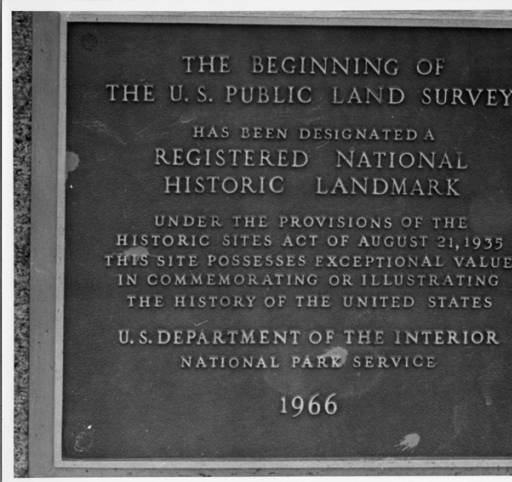 "The beginning of the U.S. Public Land Survey has been designated a registered National Historic Landmark. Under the provisions of the Historic Sites Act of August 21, 1935 this site possesses exceptional value in commemorating or illustrating the history of the United States. U.S. Department of the Interior National Park Service, 1966." --Plaque on the "north face" of the marker. 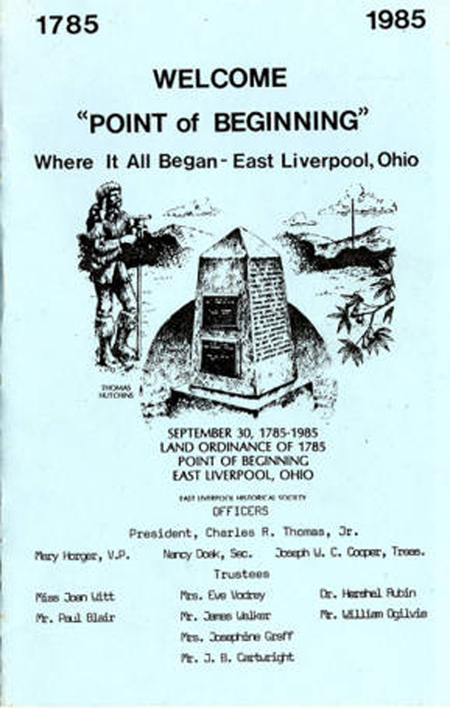 This monument c. 1960 at the Ohio/Pennsylvania border in East Liverpool, denotes the "point of beginning" for surveying the public lands of the United States that resulted from the Federal Land Ordinance of 1785. 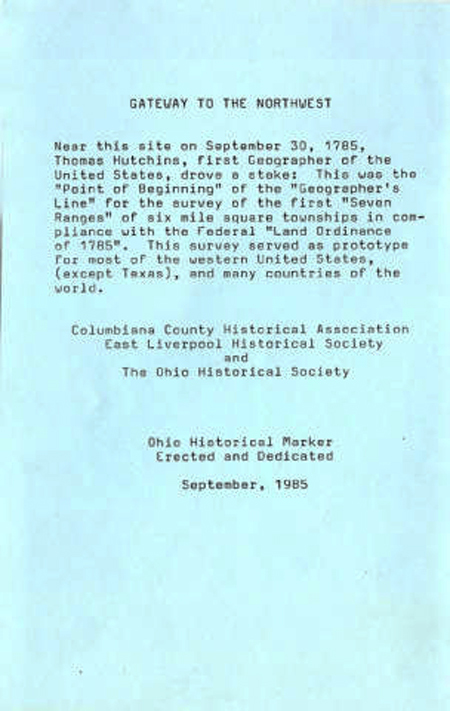 Ohio became the proving ground for the rectangular system of surveying (one-mile square sections of land, etc.) that prevails in almost every state west of this point. 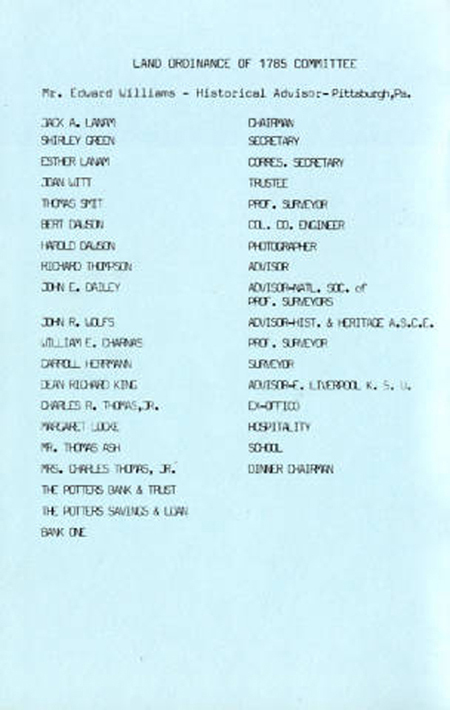 A 1960 dedication of the Point of Beginning. 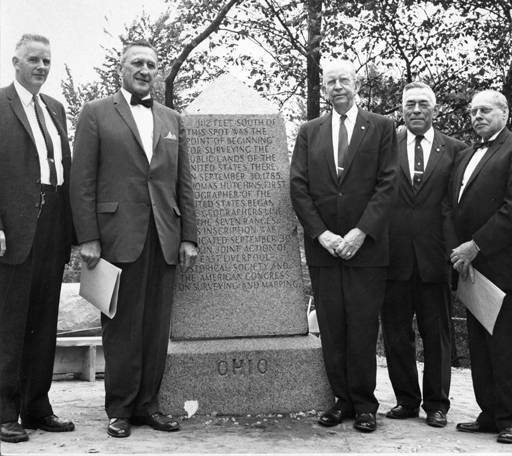 "Dedication of the Southern Terminal Monument, 'Point of Beginning' at the Ohio Pennsylvania border. 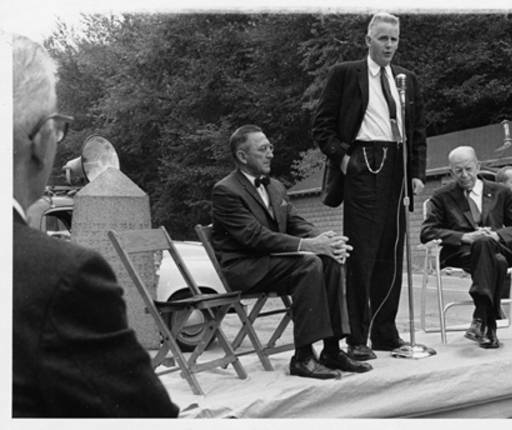 The man in the chair on the speakers left is William 'Judge' Vodrey and his son William Vodrey Jr. is the speaker." Present were five representatives of American Congress on Surveying and Mapping. Locally William Vodrey Jr. presided at state line program." Dedication of "Point of Beginning" Marker of the U.S. Public Land Surveys, 175th Anniversary "Dedication of "Point of Beginning" Marker, September 30, 1960 - 175th Anniversary of the U.S. Public Land Surveys. The five representatives of American Congress on Surveying and Mapping. "Point of Beginning" Monument for the U.S. Public Land Surveys "1112 feet south of this spot was the "Point of Beginning" for surveying the public lands of the United States. 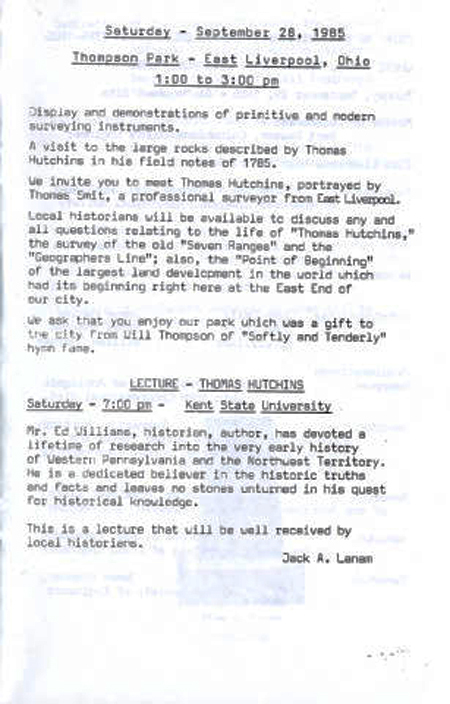 There on September 30, 1785, Thomas Hutchins, first geographer of the United States began the Geographers' Line of the Seven Ranges. 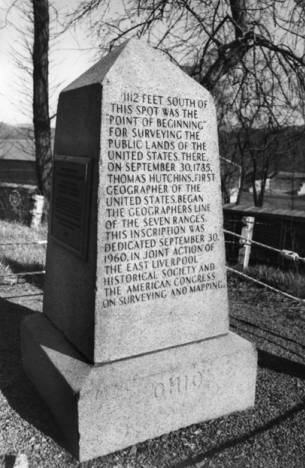 This inscription was dedicated September 30, 1960, in joint action of the East Liverpool Historical Society, and the American Congress on Surveying and Mapping. Ohio." --Inscription on the "west face" of the marker. 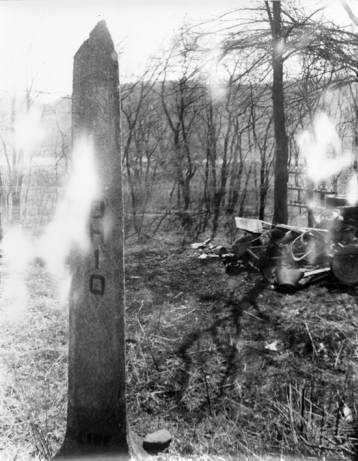 The present monument was set at the rivers' edge in 1881 when the Ohio-Pennsylvania Boundary was re-surveyed and re-marked. 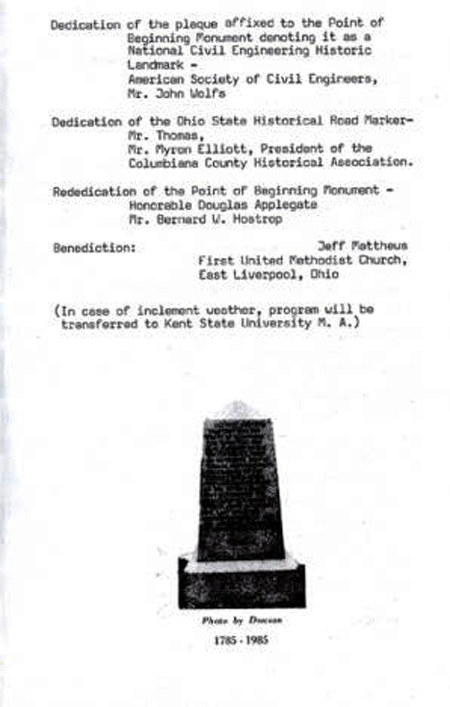 In the 1960s the monument was endangered by an industrial land fill along the river, it was moved in 1960, 1112 feet north near the River Road between East Liverpool, Ohio and Midland, Pennsylvania. 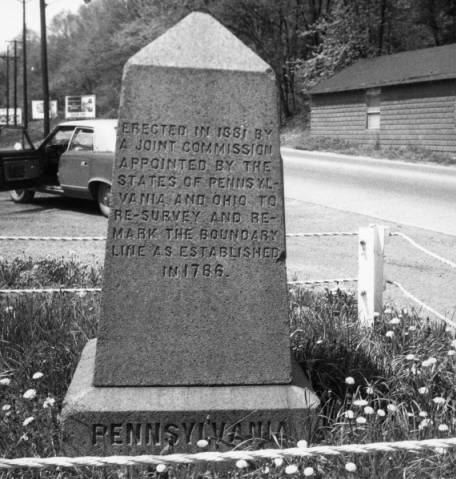 "Erected in 1881 by a joint commission appointed by the states of Pennsylvania and Ohio to re-survey and re-mark the boundary line as established in 1786. Pennsylvania." 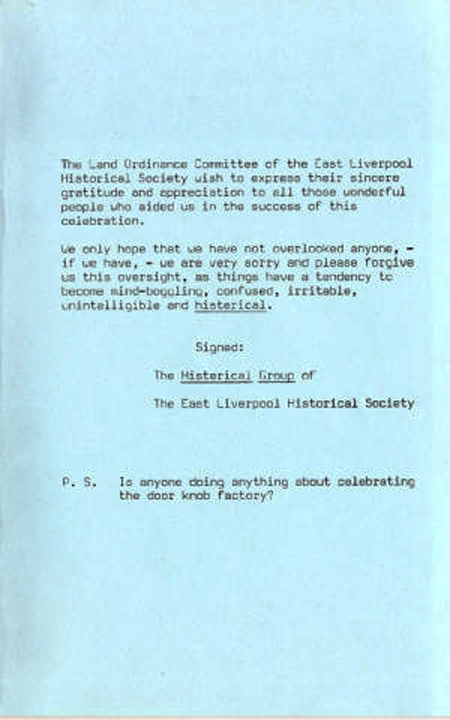 --Inscription on the "east face" of the marker. Congress passed the Land Ordinance of 1785, which defined a township as 6 miles by 6 miles, with baselines north-south and east-west, for all lands west of this point. The 36 individual square miles of a township are called sections. Near this monument was the first surveyor's marker from which all surveys west of this point, except Texas, radiate. There is one error in this one. It says this "is located besides a four-lane busy road with heavy traffic". That is false. It is located beside a two-lane road with a lot of truck traffic especially. This one offers a satellite view. You have to scroll down to see the view on the page.